Santa Clara Law students at the border wall in Nogales. During Fall Semester 2018, Professors Evangeline Abriel and Lynette Parker posted an announcement for a Spring Break service trip to the United States/Mexico border. Many Santa Clara University School of Law students responded, and nine students were selected for this first annual Spring Break Border service trip. With the generous support of several alumni, and after two full-days of trainings, Santa Clara Law students Quetzalli Haro, Osvaldo Hidalgo, Marili Iturbe Guadarrama, Thania Lopez, Sharon Morales, Keuren Parra, Linette Salcedo, Christina Santora, Joaquin Torres, and Professors Evangeline Abriel and Lynette Parker departed for Arizona. Their destinations were Tucson, Florence, and Eloy, and their mission was to assist the nonprofit Florence Immigration and Refugee Rights Project (FIRRP) with their legal services work on behalf of detained immigrant children and adults. Professor Pratheepan “Deep” Gulasekaram joined the Florence team later in the week. Overall, witnessing all of these little moments of compassion on behalf of the attorneys, clients, and my peers has encouraged me to continue pursuing a career in the immigration law; an area of law that is full of individuals with such caring hearts and resilient spirits. Santa Clara Law students in front of Mission San Xavier. Their first full day in Arizona allowed them a chance to visit the San Xavier Mission on the Tohono O’odham lands just south of Tucson and sample red and green chilis and popovers (fry bread) at the Cafe Santa Rosa. From the Mission, they drove south to Nogales, the border town that is the only city on the southern border literally cut in half by the border wall. Father Neeley from the Kino Border Initiative provided an overview of the work of the project and then walked with the students and professors down to the physical barrier that divides the city and two nations. While they had seen photos of the barriers in place along the border, it was much more powerful to see the wall with its rows of barbed wire cutting roads and communities in half. On their return to Tucson, the two vans carrying the law students and professors queued up with the rest of traffic on the freeway north of Nogales to go through an immigration checkpoint. Santa Clara Law students outside Tucson Juvenile Dependency Court. The week was packed with new experiences, hard work, and opportunities to connect to the people who are dedicating their time and legal skills to the children, adults, and families arriving in the United States seeking safe haven and security. The Santa Clara Law students exhibited outstanding compassion, commitment, and competency in their work. As Linette Salcedo shared, “[T]his week of working alongside such dedicated attorneys and legal assistants who fight on despite the challenges and set backs, has been extremely encouraging. I am also extremely inspired by my peers and professors who selflessly decided to spend their time and energy immersing themselves in this work during Spring Break. Overall, witnessing all of these little moments of compassion on behalf of the attorneys, clients, and my peers has encouraged me to continue pursuing a career in the immigration law; an area of law that is full of individuals with such caring hearts and resilient spirits.” The students’ professionalism and the quality of their work were recognized and praised by the FIRRP legal teams. For the professors, it was a true honor to accompany and work with these law students. It was clear from this experience that the future of legal services and leadership are in excellent hands. As the Santa Clara Law students and professors prepared to depart, they took with them the warmth and friendships they formed, the urgency of the work and role each of them had in responding to the legal needs of those who have journeyed far from home, but most of all they took with them a sense that they are part of a community serving their fellow human beings full of courage and hope. 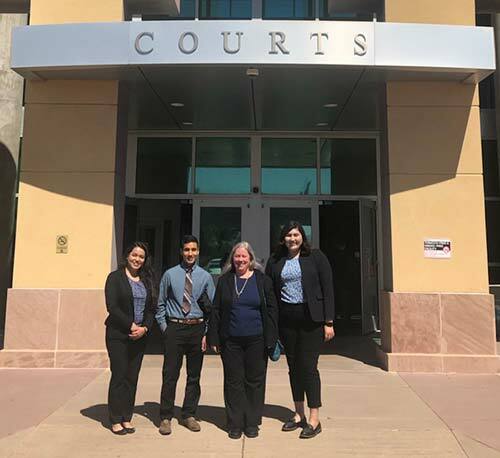 Read more about this initiative from the perspective of Santa Clara Law students through their posts on the Border Blog. This trip was made possible by generous contributions from Santa Clara Law donors. To learn more about how to support initiatives like this and other impactful programs please visit law.scu.edu/giving.